It’s a four-letter word no newspaper columnist ever wants to write, but sometimes it can’t be avoided. OOPS! In last week’s column, “My New Best Friend,” I wrote about signing up for the Federal Trade Commission’s Do Not Call registry. The problem? I hit a wrong key when typing the phone number. My thanks to readers who pointed out that the number published in the paper is actually for a company that wants to send callers age 50 and over a free medical alert system. Ironic, huh? The official FTC number is 888-382-1222. Sorry for the mix-up. And in another follow-up note, I’m grateful to the many, many readers who responded to my February 26 column about Atomic Fireballs. You e-mailed, Facebooked, called and told me in person that I needn’t despair simply because Dollar General Store had replaced real Ferrara Pan Atomic Fireballs with imposters called Tongue Torchers. Many readers pointed out that Sam’s Club sells a 240-piece tub of genuine Fireballs for less than ten dollars. They’re also available locally at Cracker Barrel and CVS and can be ordered from several online sites, including Walmart, Target, Party City and amazon. Here’s the problem with those Fireballs. Most of them appear to be the large size. We used to call them “nickel” fireballs when they could be purchased individually. They’re so big and so hot that I can’t pop one into my mouth and leave it there, meaning that I have to reach in and take the candy out for a minute or two while my mouth cools down. This isn’t something I’m crazy about doing in polite company, never mind that it makes my fingers red and sticky. And those Fireballs have half again the number of calories, 30 as opposed to 20, as the smaller ones. Amazon sells what are described as “small” Fireballs for $9.66 for 80 pieces. At 12 cents per Fireball, I’d have to label that highway robbery, especially compared to four cents per piece that Dollar General charged. Maybe it’s time for me to switch to a new candy. 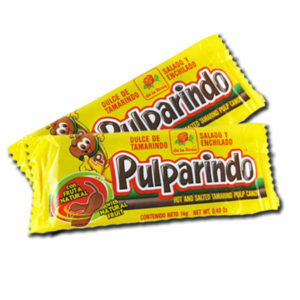 My cousin Billie Jo, who for many years lived in El Paso, Texas, suggested I try Pulparindos. I’d never heard of them, but after some quick research learned that they’re a Mexican candy made by de la Rosa candy company from the pulp of the tamarind fruit—a tropical legume high in tartaric acid, B vitamins and calcium–and flavored with sugar, salt and chili peppers. This combination is said to make for a simultaneously tart, sweet, salty and spicy treat. Billie Jo promised to send me a package of Pulparindos. “Delicious but they will flat strip the lining from your mouth!” she wrote. Hmmmm. Sounds like something that might be right up my alley. I only wish that Dollar General Store had the good sense to carry them.